1) They aid membrane protrusion by resisting actin retrograde flow  and hence, indirectly promote the force produced by lamellipodial actin polymerization. 2) They convert myosin pulling forces at the lamellar interface into traction forces against the ECM that pulls the cell body forward . Actin filaments are constantly undergoing polymerization and depolymerization, resulting in retrograde flow. The ‘molecular clutch’ engages when actin filaments connect to integrin to form focal adhesions. The resistance provided by the focal adhesions against retrograde flow promotes membrane protrusion. Also, contractile forces generated by myosin are converted by the focal adhesion into traction forces against that ECM. Combined, these forces drive forward movement by membrane protrusion. 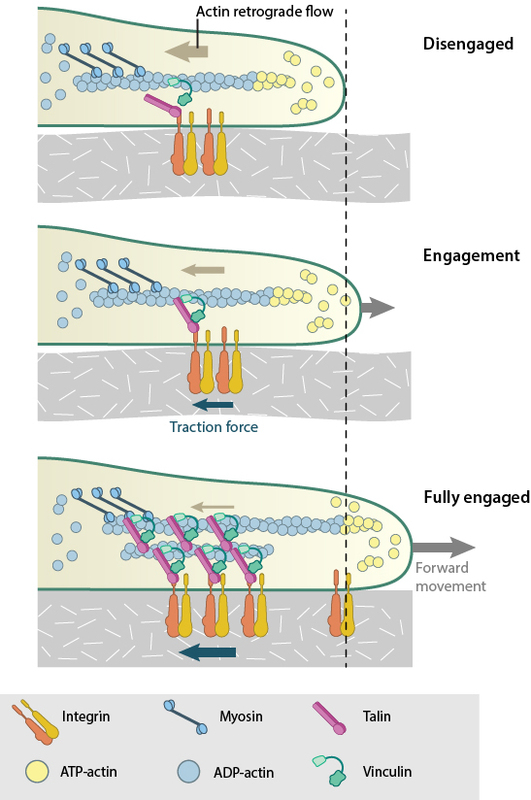 As the focal adhesions mature, the connection to actin is reinforced and the clutch become fully engaged. These two methods are interdependent and cooperatively contribute to the propulsive forces generated at the leading edge. The efficiency of the molecular clutch in converting this force into protrusion is variable. Because some components of the adhesion complex move along with the retrograde flow , the clutch slips . The rate of forward protrusion increases however when actin and actin-adhesion linking components become more organized  and the retrograde flow of actin is subsequently slowed down . In this case the clutch can be described as “partially engaged”. 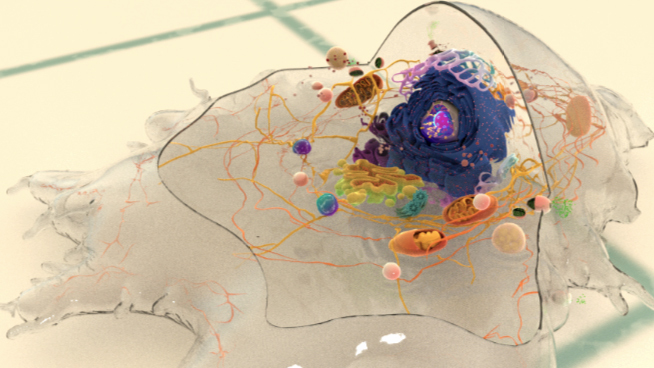 As the adhesions grow and mature under stress, the clutch transforms from being “partially/locally engaged” to “engaged”  and hence can influence global cell behavior . Experiments have demonstrated that a biphasic relationship exists between the rate of actin flow and traction stress . Whilst they are inversely related in the lamellipodium where nascent adhesions are formed and actin flow rate is high, the relationship becomes linear in areas with larger adhesions and slow actin flow , generating maximal propulsion at intermediate flow rates . Two recent studies propose stochastic models that explain the state of adhesion clutches in these two regimes  (reviewed in ). One study describes how adhesion stability is modulated by the competition between energy required for maintaining the elastic bonds at the moving actin-clutch interface, and the energy dissipation that occurs when myosin pulls in the viscoelastic actin interior . When the transmitted force and the speed of actin flow are moderate, much of the energy is invested in producing traction on the substrate. At this critical transition range, either an increase or decrease in the ratio of bound adhesion complexes could theoretically occur. In the second study however, based on known experimental results, it was assumed that at moderate actin flow rates adhesion clutches reach a quasi-equilibrium state between bound and unbound forms . Thus the catch bond model of receptor-actin interactions are more convincing than the slip bond since it is more likely to lead to clutch engagement and adhesion growth, as observed in the experimental studies.